On the Dutch depolitized paradigm shift of the 1980’s. Presentation at IIPE conference in Pula, Croatia, september 2018, by Merijn Oudenampsen. But Lubbers never attained the tough image of an ‘iron lad’ in the Netherlands. In fact, it would have been more appropriate for Time Magazine to call him Ruud ‘Smog’, due to his reputation as a living smoke machine. Among others, future right-wing populist firebrand Pim Fortuyn pointed to Lubbers’ ‘sphinx-like character’ and remarked on his consensual ‘magic formulas’, so ‘Jesuitically unclear’ that ‘all participants left with the impression that they had been proven right’. [ii] The Dutch neoliberal turn was sold to the Dutch public as an apolitical and technocratic operation and lacked the ideological drive of Thatcher and Reagan. In so doing, the Dutch experience clashes with the way that the breakthrough of neoliberalism is generally understood. The shift from Keynesianism to neoliberalism in the 1980s has been the central object of study of institutional research, developed by scholars such as Peter Hall, Mark Blyth, Vivien Schmidt and Colin Hay. Building on the work of Thomas Kuhn, policymaking is conceived of in terms of a sequence of relative stable paradigms, which are overturned and replaced in times of crisis. A key argument in the literature is that a paradigm shift is a moment of politicization, or in the words of Peter Hall, that ‘the movement from one paradigm to another will ultimately entail a set of judgments that is more political in tone.’ Such a transformation involves a shift in ‘the locus of authority’ over policy making away from established policy elites to outside actors (in media and politics). Peter Hall has famously used the rise of monetarism under Thatcher as a basis for this argument. Politicians, journalists and intellectuals took the lead in formulating new ideas, as the old Keynesian policy elites at the Treasury were gradually replaced by Thatcher’s appointments, all avowed monetarists. Based on the Dutch case, this paper aims to examine this alternative trajectory of institutional change, which may be more widely applicable to other continental European multiparty systems in which more consensual forms of politics prevail. 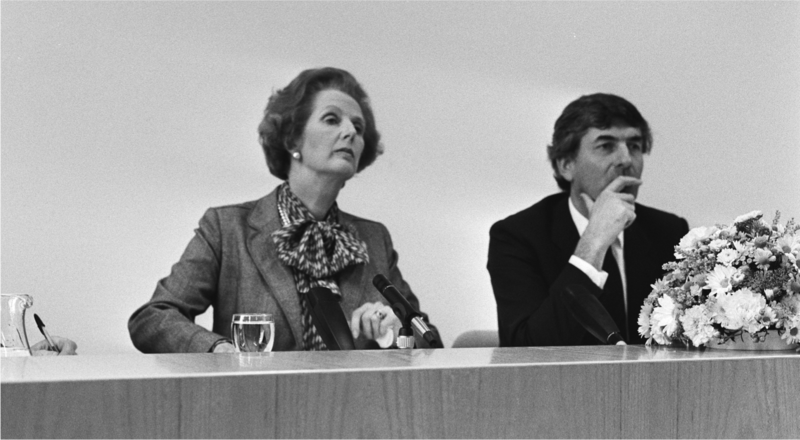 The Dutch counterpart to Thatcher and Reagan was formed by the three subsequent coalition governments led by Ruud Lubbers (1982-1994). The rapidly deteriorating condition of Dutch public finance and the declining rate of corporate profitability in the late 1970s led to a concerted attempt by political and business elites to sideline the corporatist institutions. After increasingly anxious attempts to reach a compromise with the trade unions, it was finally decided to unilaterally implement harsh austerity measures and drastically cut public sector wages under the first Lubbers cabinet of 1982, comprised of Christian Democrats (CDA) and right-wing liberals (VVD). This was accompanied by a new market-based agenda, comprising flexibilisation of the labour market, deregulation of product markets and privatisation of key state enterprises. Instead of Thatcherite or Reaganite all-out confrontation however, the Lubbers government chose to pacify the opposition – the leadership of the trade unions and later the social democrats – resulting in the Wassenaar Agreement of 1982, and the Dutch wage moderation strategy. This was clearly an agreement that was forcefully imposed by the state and Dutch business elites, signifying a historical retreat by the Dutch trade unions. Yet it was successfully sold to the public as a voluntary, consensual agreement, soon to assume mythical proportions in the Dutch public imagination as the birth of the ‘polder model’. In contrast, the more politicized role of brokering new ideas and contesting the established paradigm was taken up by policy elites. The man that is often credited as the ideological linchpin of the economic reforms of the 1980s is Frans Rutten, an economist from a Catholic background who served as the head of the department of Economic Affairs from 1973 till 1990. In a newspaper interview, Cees Oudshoorn, the current president of the Dutch Employers Organisation (VNO-NCW) hailed Rutten as the man that has ‘made the case for Reaganomics in the Netherlands’. Rutten headed the taskforce Algemene Economische Politiek (AEP, General Economic Policy), an elite ministerial think tank overseeing macro-economic policy. Echoing the famous name of the Chilean Chicago Boys trained by Milton Friedman, the group serving under Rutten were dubbed the ‘Rutten Boys’. Jarig van Sinderen, one of the Rutten Boys, highlighted the trailblazing role of the AEP in its turn from the demand-side economics of Keynesianism to the supply-side model of Reaganomics in the 1980s: ‘AEP-members had looked around in the United States, where Reagan aimed for economic recovery with his Reaganomics recipes: cut taxes and let the market do its work. The committee adopted ideas that had not reached the Netherlands yet. ‘We were vilified for it,’ Van Sinderen complained. [ix] Both adversaries and opponents shared this perspective on Dutch economic policy elites, as highly politicized actors who initiated the paradigm shift of the 1980s, while politicians followed suit. Rutten had formulated his political views in a series of articles in the leading Dutch economics journal ESB. Taken together, it amounted to a surprisingly radical reform agenda inspired on Reaganomics. In his article of 1987, he retrospectively called this programme De Nieuwe Zakelijkheid (The New Objectivity). The core idea is that the ‘government needs to concentrate on its primary tasks (such as justice, education, roads, defence) and should limit its less essential tasks (all sorts of subsidies and other interventions in the market economy)’. In the long run, the government should stop taking care of ‘quasi-public goods (social security, healthcare, education)’ altogether, and transform these terrains into markets through vouchers. [xi] An approach famously advocated by Milton Friedman. Not surprisingly, Rutten wrote that Dutch economic policy was in need of a long-term vision, and that he based his vision on the writings of Adam Smith and Milton Friedman. [xii] In a paradoxical role reversal, Frans Rutten’s writings represents the most explicit ideological vision to come out of the Lubbers cabinets. To summarize: in the paradigm shift of the 1980’s in the U.K. and the U.S., the public battle of ideas took precedency over established policy-making. While in the Netherlands, economic policy elites were the more activist and ideological figures. The predominance of an internal policy discourse does not preclude conflict in this case. What we are likely to see then in the Netherlands is a hidden, enclosed conflict over policy ideas, rather than the overt and public war ideas seen in the Anglo-American context. [v] Hans van der Voet, cited in Van Tijn and Van Weezel, 1986: 245. [vi] Van Tijn and Van Weezel, 1986: 74. [vii] Van Tijn and Van Weezel, 1986: 59. [viii] Van Tijn and Van Weezel, 1986: 161. [ix] Obbink, 2003. For a more extensive analysis of the role of the AEP, see: Raes, Van Sinderen, Van Winden and Biessen, 2002. Blyth, M. (2002) Great Transformations: Economic Ideas and Institutional Change in the Twentieth Century, Cambridge: Cambridge University Press. Daalder, H. (1990). Politiek en historie: Opstellen over Nederlandse politiek en vergelijkende politieke wetenschap. Amsterdam: Bert Bakker. Hall, P.A. (1993). Policy paradigms, social learning, and the state: The case of economic policymaking in Britain. Comparative Politics, 25(3), 275-296. Hay, C. (2001) The ‘crisis’ of Keynesianism and the rise of neoliberalism in Britain, an ideational institutionaliost approach, in: J. Campbell and O. Pedersen (eds.) The rise of neoliberalism and institutional analysis, Princeton: Princeton University Press. Jorritsma, E. and De Waard, M. (2009). De SG is weer staatsdienaar, geen mooie zangvogel. NRC Handelsblad. Retrieved from https://www.nrc.nl/nieuws/2009/01/05/de-sg-is-weer-staatsdienaar-geen-mooie-zangvogel-11663970-a1080640. Obbink, H. (2003). Beleidseconomen zijn het tegenwoordig veel te veel eens. SER Magazine. Retrieved from https://www.ser.nl/nl/publicaties/ser/2003/februari%202003/04.aspx. Raes, S., Van Sinderen, J., Van Winden, P. and Biessen, G. (2002). Het maken van economisch beleid: De rol van AEP in de afgelopen vijftig jaar. Tijdschrift voor Politieke Economie, 24(1), 7-50. Rutenfrans, C., (1999). Simonis is net zo oppervlakkig als ik vroeger was. Trouw. Retrieved from https://www.trouw.nl/home/-simonis-is-net-zo-oppervlakkig-als-ik-vroeger-was-~a731c4ae/. Rutten, F.W. (1993). Zeven kabinetten wijzer: De nieuwe zakelijkheid bij het economische beleid. Groningen: Wolters Noordhoff. Rutten, F.W. (1995). Verval, herstel en groei: Lessen voor het economisch beleid gelet op het leergeld van twintig jaar. Utrecht: Lemma. Schmidt, V. (2003) How, where and when does discourse matter in small states’ welfare adjustment?, New Political Economy 8(1), pp. 127-146. Time Magazine (1984). The Netherlands: Ruud Shock. Time Magazine. Retrieved from http://content.time.com/time/magazine/article/0,9171,949952,00.html. Van Tijn, J. and Van Weezel, M. (1986) Inzake het kabinet Lubbers, Amsterdam: Weekbladpers.